(Feel free to skip this paragraph and read on.) USB modems have been around for several years, typical quoted download speed ranges from 3.6Mbps, 7.2Mbps, 14Mbps, 21Mbps, 28Mbps to 42Mbps; typical quoted upload speed ranges from 384kbps, 2Mbps to 5.76Mbps. These figures represent the maximum theoretical "mega-bits" of data that the USB modem can download and upload in every "second". The actual download and upload speed is affected by network implementation, network conditions as well as many other factors. The above paragraph is a sales pitch that drives most people away from the shop. 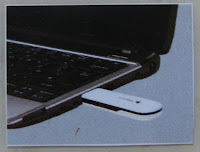 As consumers, we want to know how these USB modems can simplify our lives, right? Assuming we all knew that once we have inserted the device to our laptop, installed the software program provided, we can access the internet in just a few simple clicks. The questions is, how well these USB modems perform compare to our land-line connections at home? For basic browsing, a USB modem with 7.2Mbps/5.76Mbps quoted download/upload speed is sufficient (2Mbps if you do not upload attachments often). You can browse web pages, send & receive emails, visit Facebook and Youtube without problems. You will not feel any difference between a USB modem connection and a land-line connection. A Vodafone USB modem designed and manufactured by Huawei Technologies. Consumers now have a wide range of USB modems at a wide range of download speeds to choose from, but do they have a wide range of monthly subscription fees to choose from? I am waiting for the day when mobile network operators provide the quickest download speed at the cheapest price. Fiction? Ask Bond. Note: High speed USB modems can get really hot when downloading big data packets. Heat dissipation is often limited by its size and the design concept. Internal temperature can get up to 55°C ~ 75°C; surface temperature can get up to 45°C ~ 55°C. Ask before you touch someone's USB modem!